This calendar comes with a set of bird themed words. The words can be used for hand writing practice (on tracing cards.) They can also be used as vocabulary for older littles. We hang the words around the house and use them for a "Write the Room" activity. This activity will encourage your little to exercise numeracy skills. He/she will read the number you write on the nest and add that number of worms to the grassy area. An alternative to the paper worms is to use fuzzy pipe cleaners are your "worms" and have your little use tongs to pick them up and place them on the learning mat. This is a dynamic activity. You can use this activity to work on both color and shape identification in addition to sorting skills. If you laminate the learning mat and the sorting pieces this would a great quiet activity to take along to a restaurant, waiting room, or church service. Beautiful, watercolor illustrated birds are sure to engage and inspire your little's minds. He/she can practice tracing letters on the pictures or use them in pretend play! Practice those scissor skills with fun feathers! Encourage your little to clip the edges of the feathers to create a fringe texture! Problem solving and counting skills all in one! These are another great activity to laminate, use, and reuse! Tuck them in a ziplock bag and keep for another quiet activity on the go! Your little will use the numbers at the bottom of the puzzle pieces to piece together a picture! In this activity your little will categorize and order the size of various birds. Laminate and reuse this activity as a game. OR use the activity to have your little practice cutting skills and then glue each bird family together (in size order) on a sheet of construction paper! Letter hunts are a favorite at our house every spring! As soon at Target puts out the little plastic eggs we scoop up a couple and get right to playing. For this activity you will put the letter eggs inside the plastic eggs and then hide them. (This is a SUPER fun outside activity.) When your little finds each letter have him/her place it on the learning mat and keep hunting! See if he/she can fill up the whole mat! Sorting with critical thinking- this activity is a cut and paste delight for littles! Be careful not to get tricked by winged creatures that are NOT birds! A short and sweet foldable book for your little reader! Add the color words and build confidence using this emergent reader. Locate and identify the parts of a bird! 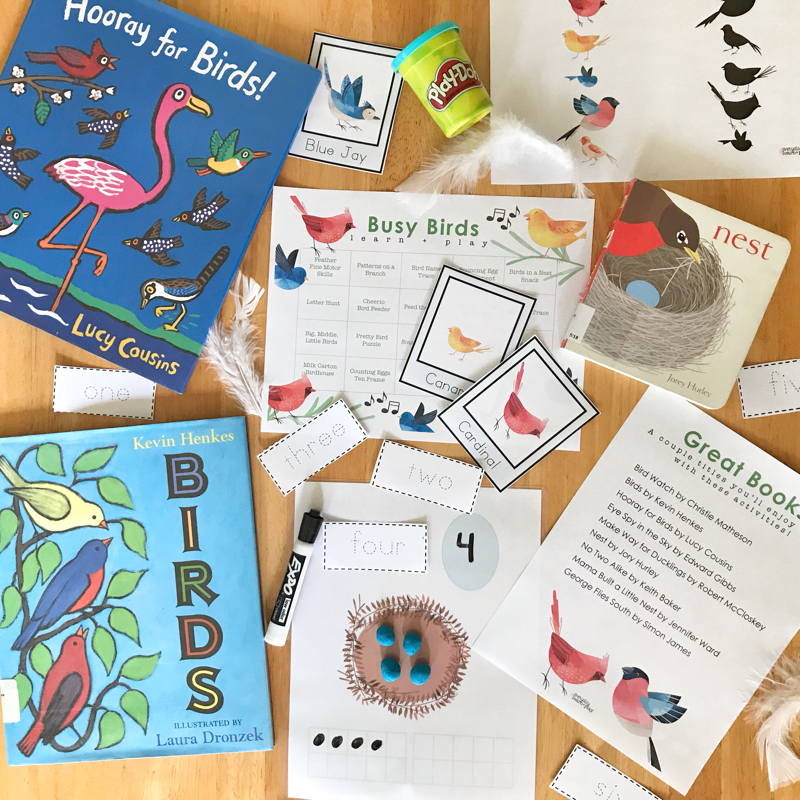 This STEM activity is a sure hit for curious little minds as they discover more about busy birds all around in nature! Recognizing simple AB patterns is more fun with hands on learning! Laminate this one for longevity and you'll have another activity packed with math critical thinking skills but still so much fun! Your little will look for a pattern and add the correct missing piece to complete the patterns. One of our favorite parts of the Learn and Play calendar is the crafts! This one is sure to be fun! You provide the materials and your little is unleashed to express creativity making bird nests with construction paper and a paper plate! A bird theme to the classic game! Perfect for the growing minds of preschoolers! The calendar comes with both a number word and numeral recognition learning mat. Practice tracing the numbers or words. Add Play-Doh egg balls to the eggs. Draw dots to match the numbers with a dry erase marker. The possibilities are endless with the Number Trace Learning Mat. The foldable mini journal is a favorite at our house! The first step in the scientific method is to observe and in this activity that's exactly what we're going to do! Your little can record the date and illustrate his/her observations! You may find yourself printing a handful of these guys! They're super easy to assemble and perfect for the budding scientist in your family! Don't forget the calendar also has a list of great titles I curated perfect for early readers and preschoolers! Most of these titles are well known, loved, and can be found in your local library!